After turning down Charles Aznavour Alley, guests of the factory are about 45 minutes away from . . . There's really not a lot to see on a tour of the Yerevan Brandy Factory. Once you've seen one barrel or bottle, the next one isn't all that different. But an hour-long visit under the big red Ararat sign is a gift to the other senses. Before a word is said; before, for example, a guide tells you that Armenian brandy has been in production since 1887 and in this factory since 1953, the smell of the product has already become part of you. Across a small garden of grapes and over the asphalt of the administration courtyard, the sweet, musky and, yes, intoxicating smell of brandy greets visitors to this hill top. An hour later, the sampling room awaits, where all the things you've been told about find their proof in three snifters of three different vintages. To get there, you first enter a reception area, where you learn that Armenian brandy is made only from white grapes from five different varieties. 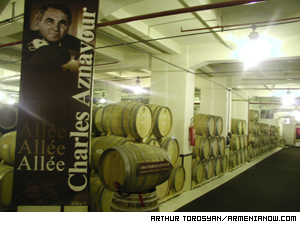 You'll walk down Charles Aznavour Alley past barrels autographed by dignitaries who have visited and been given their own stock. First Lady of Russia, Ludmilla Putin's 400 liter barrel sits opposite the same sized one owned by the Catholicos of All Armenians. You'll pass, too, the "Peace Barrel", and your guide will tell you that that special brandy will be served only when Armenia and Azerbaijan reach a peace agreement over Karabakh. And if you tour guide is a sweet girl named Marina, she will say: "Usually, it is better for the brandy to be aged. But this barrel is the only one we would like to open early." 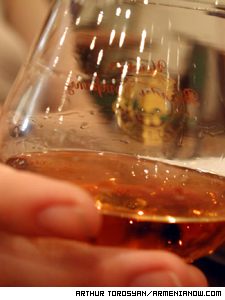 Don't call it cognac, unless you're from one of the Commonwealth of Independent States. Seems they've got some marketing dispensation (perhaps because the labels appear in Russian) on the French-held right to use of the word for product exclusively produced in France. Cognac or brandy. From the reception, to the basement where there are 450 bottles dating to 1902 and shelves holding "Dvin", a 50-proof (!) blend that was specially shipped to Siberia in Soviet times, the liquid seeps from inside its oak casks and into its admirers. British Prime Minister Winston Churchill admired Armenian brandy a lot, and a lot of it. Josef Stalin shipped 300 bottles per year to Churchill. He sent him the 50-proof stuff, which is why it is called the "Diplomat" brandy. Seems there is a lot of poetry that goes into brandy. Maybe that's because it spends most of its life just sitting around, lending itself to comment and out-right hyperbolic praise.
. . . the reason they took the tour. When you enter a room where the older brandies are "resting", you'll enjoy a phenomenon known as "the angels' share". It is the heady smelly of brandy evaporating. Three to four percent evaporates through the oak each year in a room called "Paradise". Do you know about "legs"? After the tour you will. "Legs", also known as "tears" or "church windows" is the name given to that part of the brandy that clings to the glass after it has been tilted back for a sip. It is a test of quality: The longer the legs hold, the higher the quality. This, you learn in the tasting room - the payoff for an hour of hearing brandy minutae. There, your guide might tell you that the brandy snifter should be held in the left hand (closer to the heart). And that there is a culture of brandy drinking that turns the act into something near worship. Members of the brandy-believer faith should first admire the liquid's color, then feel its aroma, then sit it down and speak to the brandy. And only after that should one partake. Think: courtship with a bottle, and you get the right idea. It is a long way and a long time from grapes in the ground to Armenian brandy in a glass. Twenty-year old Nairi, or even 10-year old Aktamar are worth the wait. And starting from the aromatic reception to the tasting room, tourists only have to wait an hour. Last year about 6,000 guests visited the factory. Tours are given from 9 a.m.-6 p.m. and cost 3,500 drams (about $6) per person. For more information: www.ybc.am; telephone, 54.00.00.